I reckon this pyramid shaped sticky rice dumpling is the most beautiful one. It’s the traditional shape mostly made by Hong Kong people. 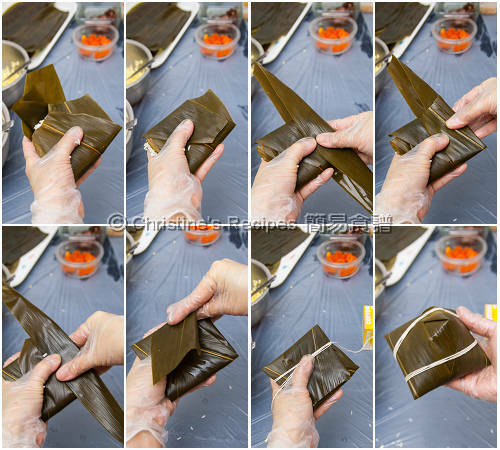 You need four pieces of bamboo leaves to make a dumpling. It sounds too many things to manage. But don’t be nervous. I posted a tutorial video below the recipe. It’s not that difficult as you thought. Dragon Boat Festival (端午節) is coming on the weekend this year. 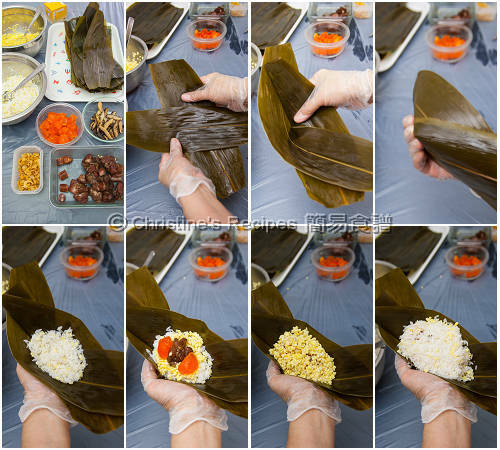 Get ready to make some sticky rice dumplings (zongzi 鹹肉糭) to celebrate? When I first learnt to make zongzi, I took the easiest way. Here's the recipe I posted previously. 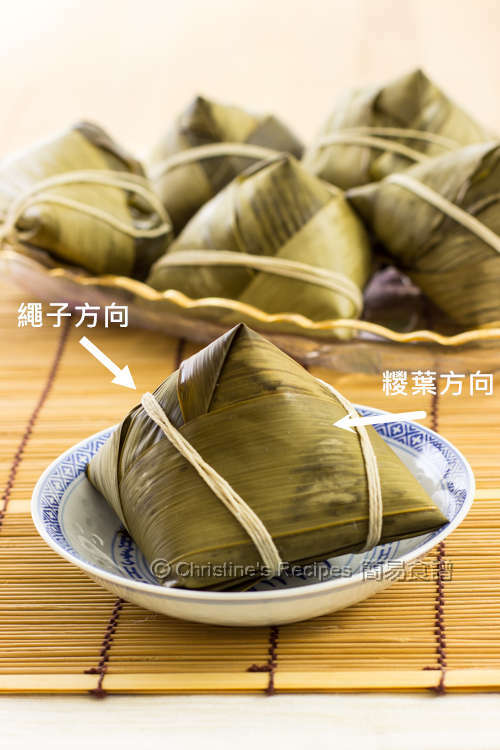 It only needs three pieces of bamboo leaves to wrap a zongzi. If you jump on the bandwagon to try making zongzi at home, I highly recommend the easiest method. You need the following ingredients to wrap one pyramid shaped sticky rice dumpling. As for preparing the ingredients, please refer to the previous recipe. 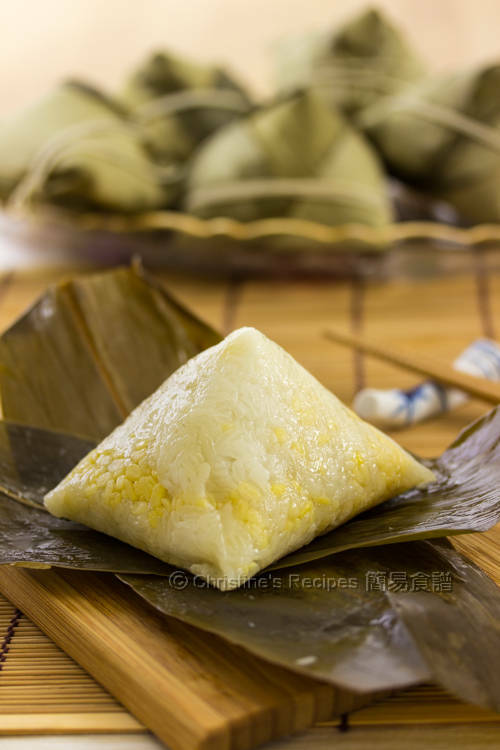 Here’s a tutorial video of how to wrap a pyramid shaped sticky rice dumpling. Hope it helps. Layer two bamboo leaves like an X shape, smooth side up, and form a cone in the middle. Be sure there’s no hole at the tip. Add in 2 tablespoons of glutinous rice, 1 tablespoon of mung beans, followed by the fillings, pork belly, egg yolk, mushroom and dried shrimps as desired. Top with mung beans and glutinous rice. Fold the upper and lower part of bamboo leaves to the middle. Add a bamboo leaf on each side to seal well and form a pyramid. Trim off the tip and end of each bamboo leaf before wrapping. Take note of the directions of tying kitchen twine. It should be running opposite direction of the bamboo leaves as the picture shown. Or else, the leaves will slip off easily and you’ll lose the rice inside. Don’t tie the twine too tight or too loose as you want the dumplings look good. The boiling time of dumplings is about 2 to 3 hours, depending on how big your dumplings are. Thanks for the video! I've made zhongzi a couple times in the past, but I could never get the shape right. Your video made it easier to understand. I will try this method and share my results with you. Thanks again! Glad that the video helps. Let me know how you go. I love this tutorial! And the zongzi looks very delicious!! Thank you very much indeed. This is the way my mother showed me how to warp dumplings when I was small! it's an old-fashioned way of wrapping dumplings in Hong Kong. You're so lucky to have your mother to make dumplings for you. Yeah, time flies too quickly. Bamboo leaves!!! You have to realize, that you are posting to an international audience! In Canada for example, unless you live in Vancouver on the west coast, one could never find bamboo leaves, even in Toronto with the World's largest Chinatown! Now on the other hand, banana leaves are readily available everywhere in Canada, even on the east coast in Nova Scotia. I have two packs in the freezer right now. Could I not use those?? I'm aware of the fact that all my readers are from all over the world. Sorry to hear that you're located in somewhere that bamboo leaves are not handy to you. 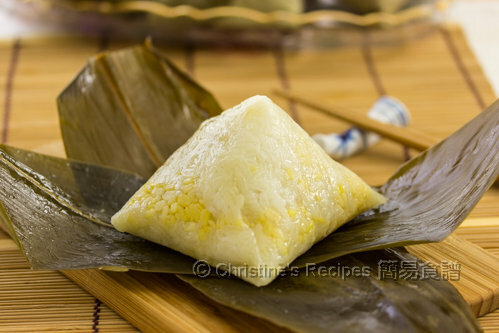 This is a traditional recipe of making sticky rice dumplings with bamboo leaves in Hong Kong. I think it's because bamboo leaves are quite cheap and popular in South Asian areas, whereas banana leaves are difficult to source. Many years ago, I couldn't easily get bamboo leaves in Australia either. Now, lucky us, we've got some available at Asian grocers. If you really want to give this recipe a go, you may try using banana leaves. Just wrap all the sticky rice with fillings tightly. The taste is equally good. That is not true, bamboo leaves could be easily found in Chinatown in Canada especially Toronto. I live in Ottawa and it is sold in many of the Asian markets. My mom is coming over tomorrow to show me how to wrap them. But I did my homework first and I think your video had explained it well. Wonderful ! Thanks for sharing where people living in Canada can find bamboo leaves. You're so lucky to have your mum showing you how to wrap these dumplings. And glad that my video can be of help. Enjoy ! How did you marinate the pork belly? I mainly used five spice powder, soy sauce, salt, sugar, wine and pepper to marinate the pork belly. I posted the full recipe link on this post. FYI, post it here again. Here you go Cantonese Sticky Rice Dumplings (廣東鹹肉糭). Oh, can you see these words "Here’s a tutorial video. Hope it helps." The video is just under the line of words. Click to play.